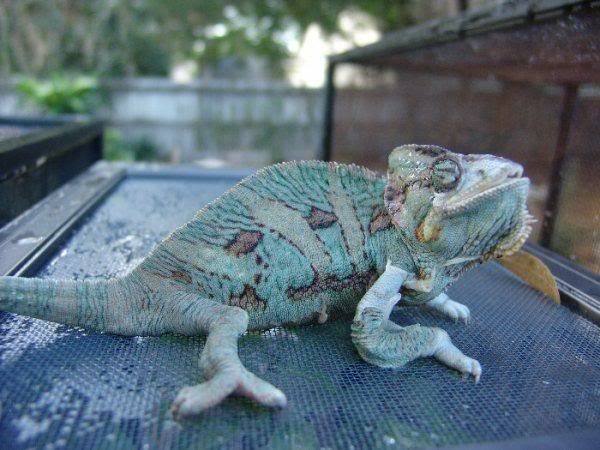 Chameleons change color, that’s what they are famous for. They will also show with their colors what their internal state is. 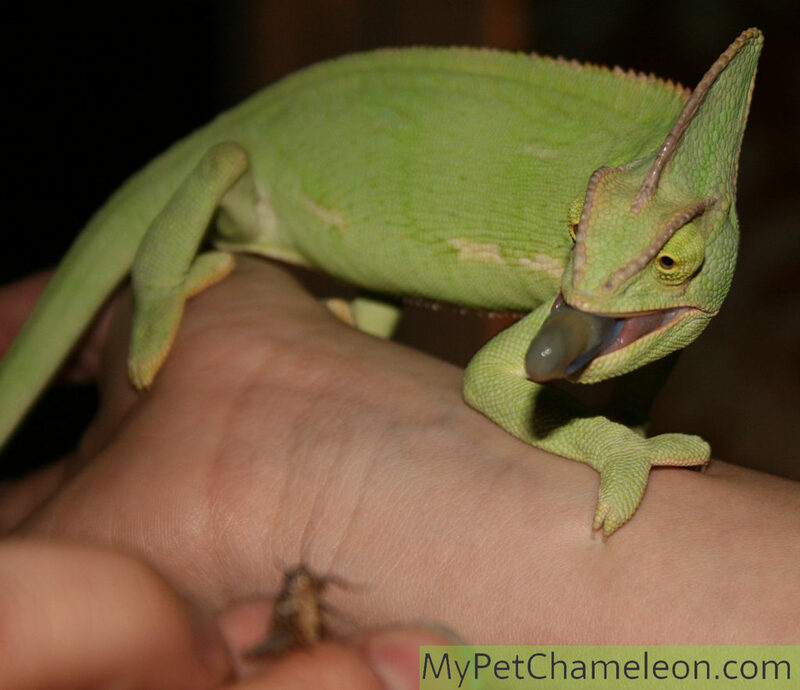 By the color of your chameleons skin, you can see if it is aggressive, ready to mate, scared, sick or feeling pretty good. The natural resting color of a chameleon varies with the species. It also depends on a species what colors their skin can become. 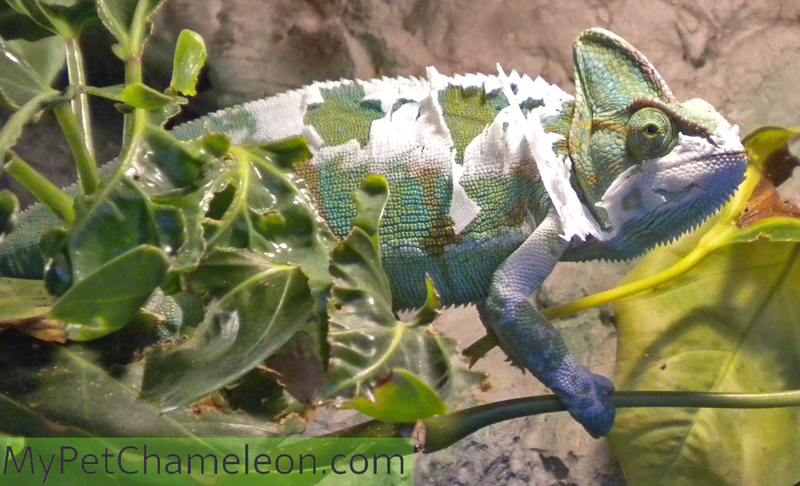 For example, a veiled chameleon can never turn bright red like a panther chameleon can. Some small species of chameleon can only change color in the brown-black range. 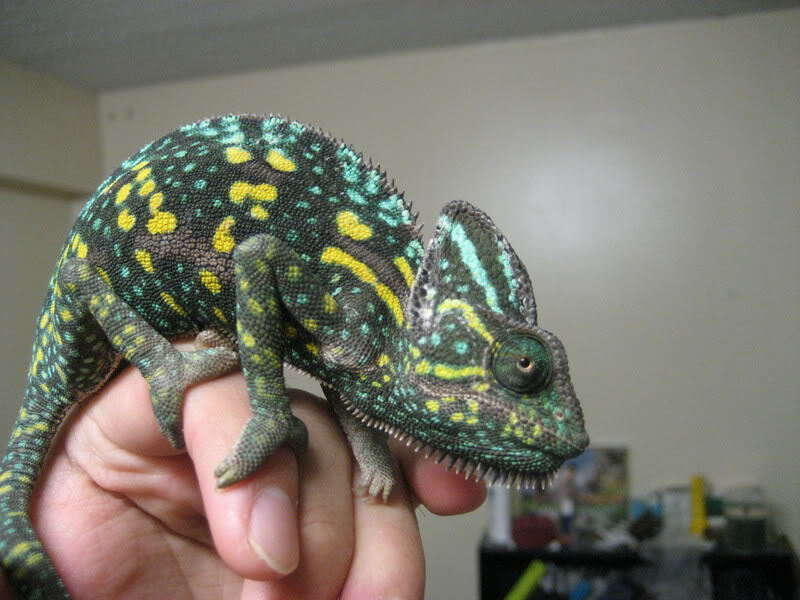 Therefore I’ll keep this page just about one species of chameleon, the commonly kept as a pet veiled chameleon (Chamaeleo calyptratus). When an adult veiled chameleon is sleeping or just resting without any special mood, it is light green in color. You could see a small lighter patch on its side, or some faint pattern. Very young veiled chameleons are mostly this color. When they get older they can start to show the bright color patterns. 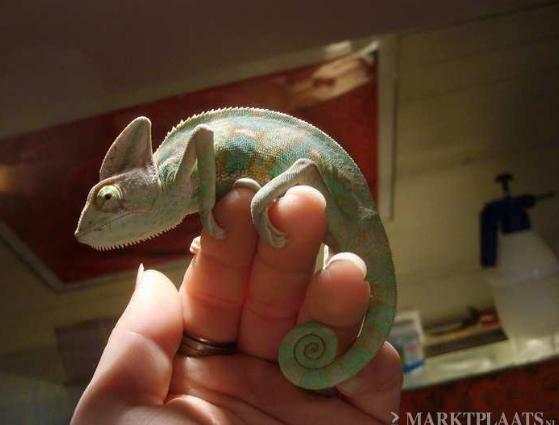 A healthy chameleon is usually this color, only to change now and then because of mood or other special circumstances. 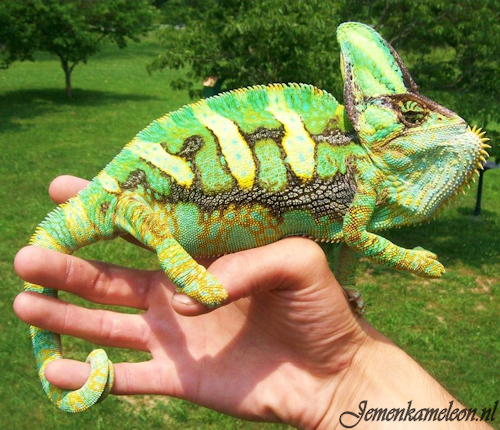 A sick chameleon can still be this color of light green, but usually they change color semi-permanently to something darker. As a veiled chameleon gets older, it becomes more and more dominant in showing what it wants. It won’t be as easy to touch or pick up as when it was young. A young veiled chameleon will generally stay light green in color, only showing color changes more often when it gets older. It can change color though, from a very young age. 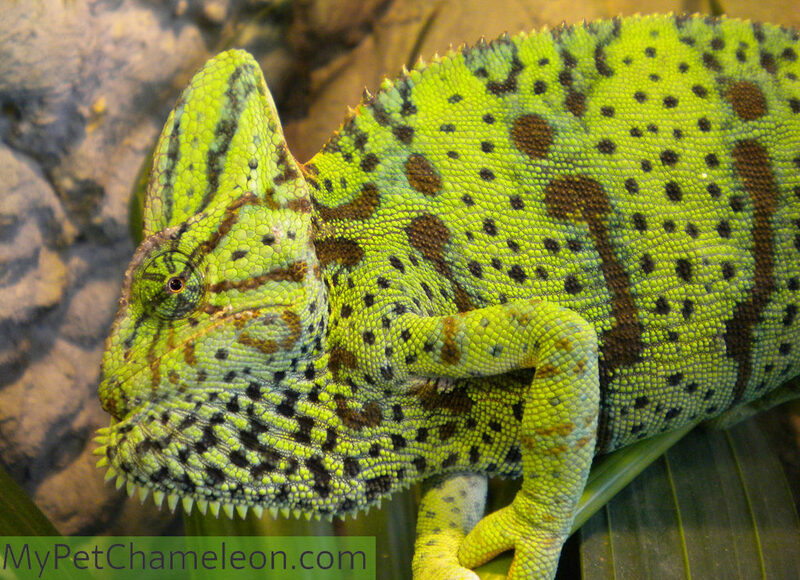 An older chameleon will show its unwillingness to be approached by changing color to a bright color pattern. It is a high contrast color pattern, with a light green background, yellow stripes, brown stripes and spots and dark green spots. The details vary a bit. 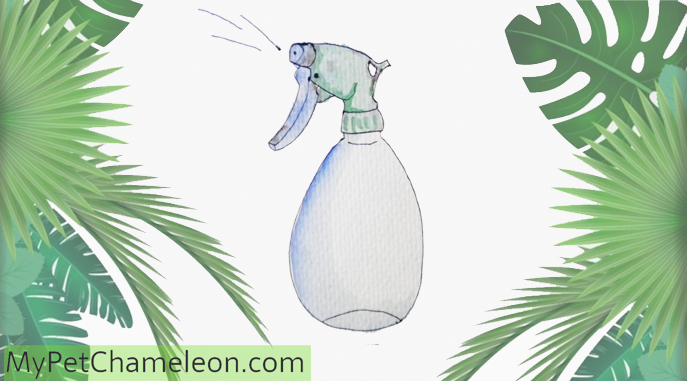 It will show these colors when showing aggression to you or to an other animal or chameleon. Generally it will also inflate its throat and will lift one leg, sometimes it will open its mouth and hiss. These colors serve to intimidate any rivals or threats. Healthy chameleons will show these colors whenever they feel like asserting themselves. As a chameleon cannot flee very quickly, strong colors are their way of scaring off predators or showing other chameleons of its own species that it will not be messed with. An adult female veiled chameleon showing with her colors and throat that she does not want to be approached. 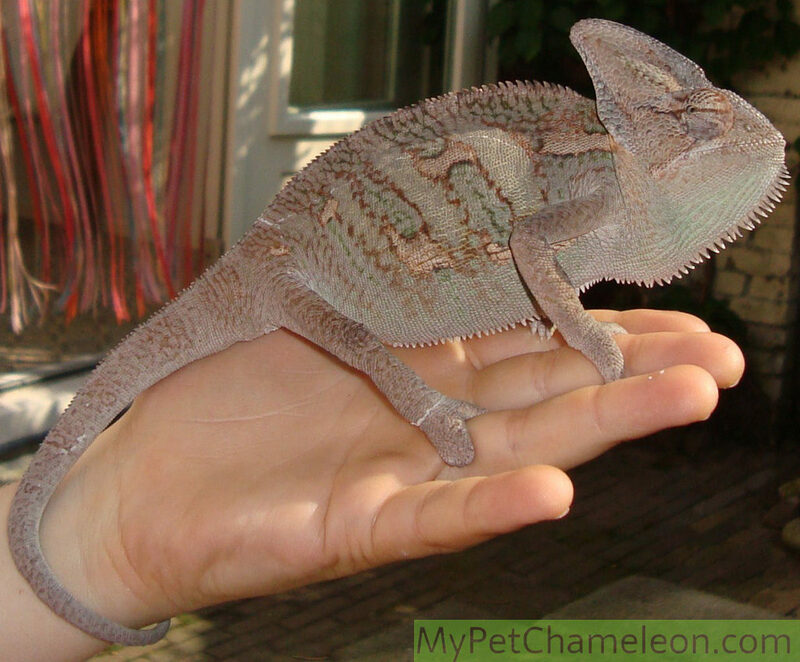 Sometimes a veiled chameleon will change its colors to brown or beige overall. The light green color is gone and replaced by brown. It can still show some color patterns, but they are not bright and colorful. A chameleon will show these colors either to warm up better or as a signal to show its not feeling well. Of course its not a signal meant for you to interpret, but we can use it as an important indicator that something is wrong. When your chameleon is brown or beige all the time, you should consult a vet specialized in reptiles to figure out what’s wrong. 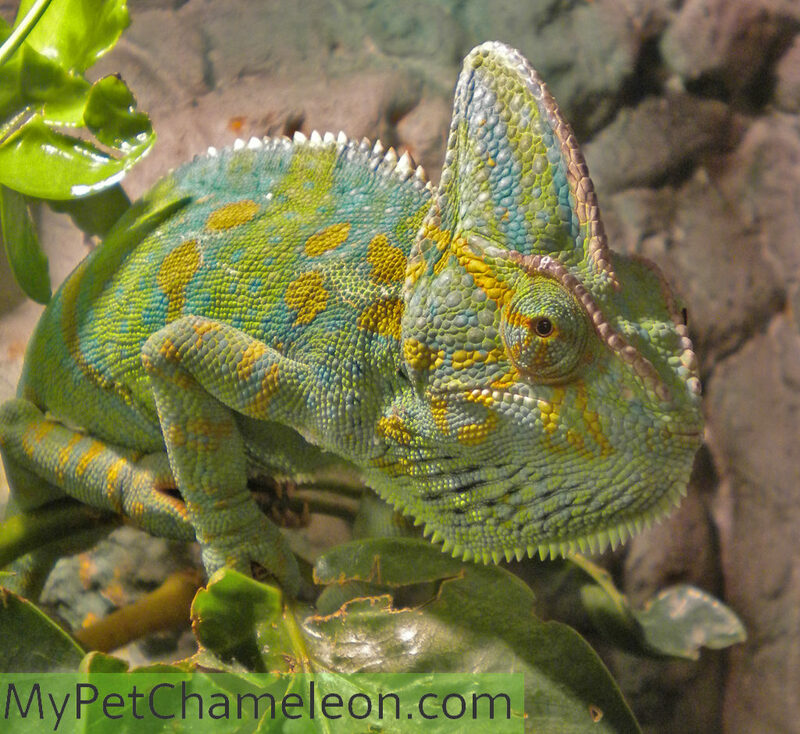 Dark colors make it easier for the chameleon to warm up, as dark colors absorb more heat from light. 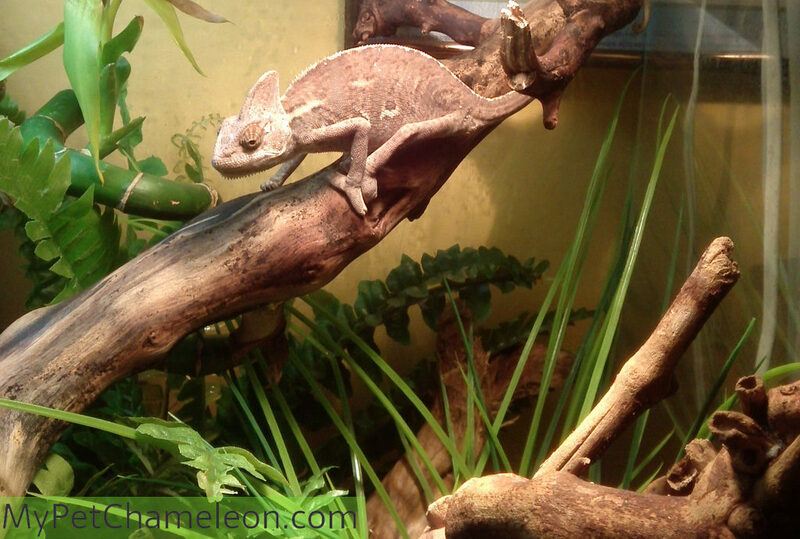 The first thing you should check for is that the enclosure is warm enough and that the chameleon can reach the radiant heat system close enough to warm up. A male chameleon can show color patterns to indicate it wants to mate or to fight. 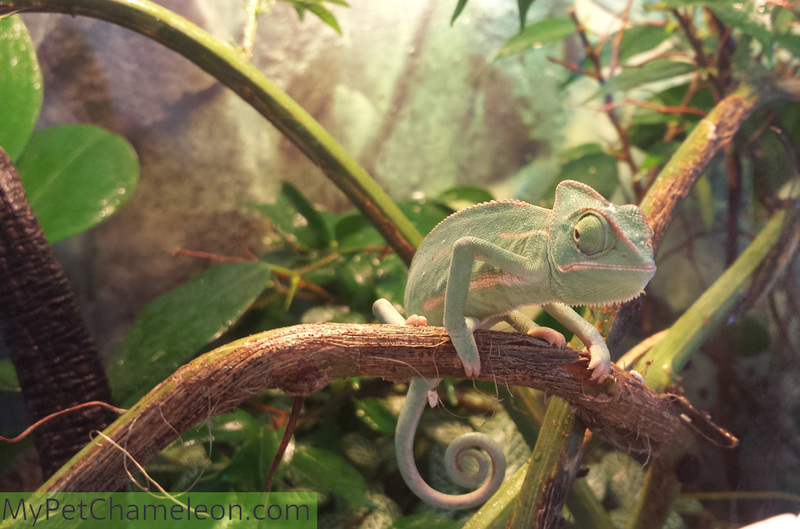 Female chameleons that are adult could show a special color pattern that indicated willingness to mate. They will show this generally, but especially when a male is present. If she is not willing to mate, she will change her colors when the male approaches. The colors indicating willingness to mate in females are golden stripes with light blue and green background. 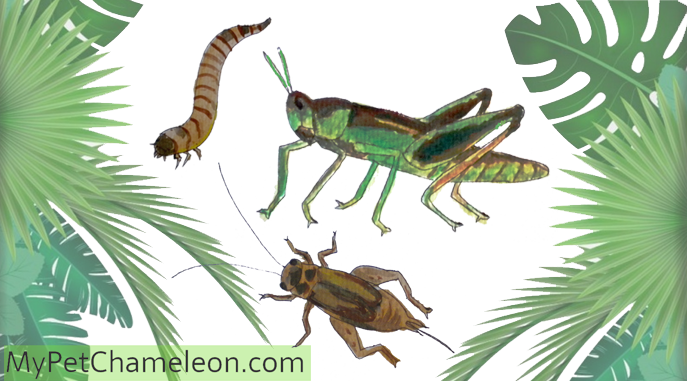 When a female is gravid (=pregnant with eggs) it will show her gravid coloration when approached by a male. This gravid coloration is a dark green background with bright yellow dots and light blue dots. A female chameleon can get gravid without having been mated. She will have maturing eggs inside her body that she will lay, but as they are not fertilized by a male they will not hatch.